I don’t think that’s how this works. 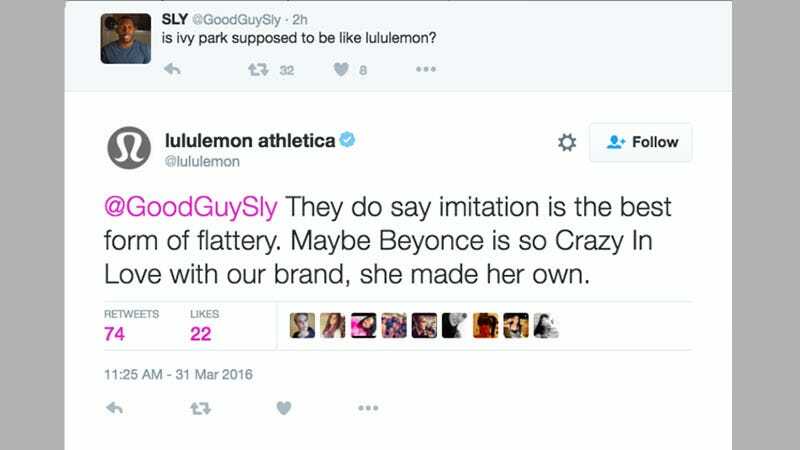 The official Twitter account of Lululemon, the activewear line known for its semi-transparent yoga pants and a problematic founder with a name straight out of a comic book, suggested Thursday morning that Beyoncé Knowles’s new athleticwear line, Ivy Park, is nothing but an imitation of their precious, overpriced wares. Though he’s been gone for over he’s been over a year, his stench is apparently still lingering, and Lululemon is now apologizing for their statement to Bey-stans/people who know when yoga pants were invented on Twitter. A preliminary search for Lululemon’s Twitter accounts calling Kate Hudson’s activewear line Fabletics an imitator found no results.